As many as a quarter of a million civilians in areas under siege around Syria need the UN Security Council to push for unfettered humanitarian access to alleviate their suffering. In one location alone - the Yarmouk camp for Palestinian refugees south of Damascus, in which Syrian nationals also live - the organization has received the names of more than 100 men, women and children who have died during a siege imposed by the Syrian armed forces last July following clashes with armed opposition groups. Starvation, lack of adequate medical care and sniper fire have been the main causes of death. The situation for civilians trapped and under siege in a number of locations around Syria is truly dire, with vital food and medical supplies either in short supply or completely lacking. Its non-binding “Presidential Statement” on humanitarian access, seen as a small step forward when adopted on 2 October last year, has remained essentially a dead letter. The Council, including Russia and China, must adopt a strong resolution on access and not fail Syria’s besieged civilians now. The increased humanitarian access in a limited number of areas is just a drop in the ocean when compared with the massive civilian suffering across Syria today. 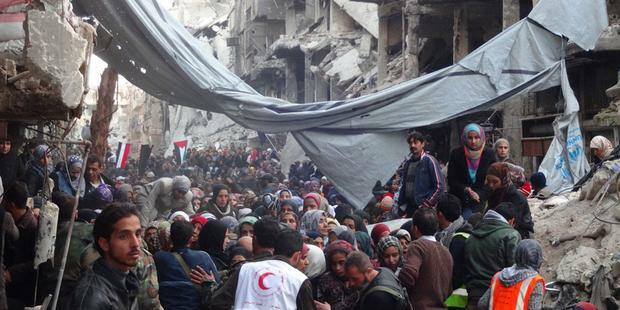 Civilians have been caught in the crossfire and cut off from humanitarian aid for too long. With the Geneva talks between the Syrian government and armed groups faltering, the UN Security Council has no time to lose to ensure adequate humanitarian access is allowed to reach all civilians in need.